The new full length release from UK based Reggae Don and YouTube sensation! His "Cucumba" video has 43 million views on Unilad and there is the 'Breakfast Show' support from BBC Radio 1, Nick Grimshaw plus constantly live performance activity. 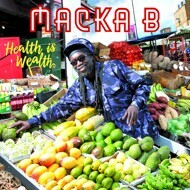 Macka B (born Christopher MacFarlane) is a true global messenger for reggae music since the mid 80ies and his new "Health Is Wealth" longplayer is 16-track strong (with 12 on the LP-vinyl). It will be accompanied by multiple music videos, has Maxi Priest as featured guest on "Jah Jah Children", and is available as black LP-vinyl in a standard sleeve jacket. It's time to think big!